Trees that are in backyards and public spaces in an urban setting offer sufficient shelter and food for squirrels. Squirrels are agile climbers and will be heard and seen scurrying to the top of trees leaping from one branch to the next as they look for nuts and berries. Squirrels are also known to chew the bark of trees that often leave visible signs of damage. 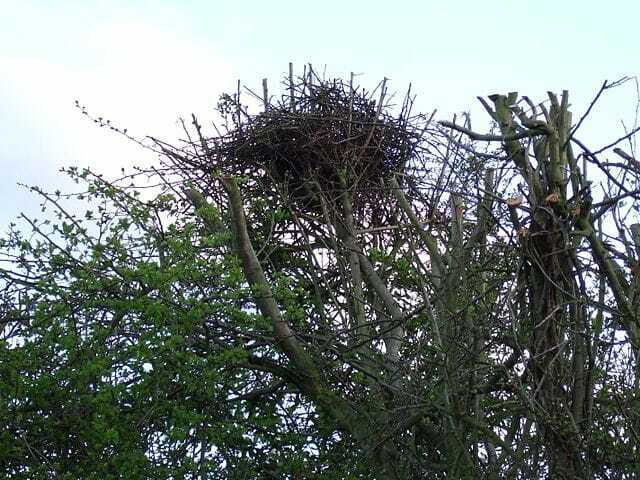 As autumn approaches and leaves begin to fall, squirrel nests that are mostly comprised of twigs and leaves can be seen securely nestled in the crook of sturdy branches of its host tree off the ground. Their tendency to nest in attics is perhaps the sole reason that squirrels are regarded as pests in the first place and should be removed by squirrel removal Toronto. Squirrels living in trees will at some point try to chew their way through small openings, climb on drain spouts or jump onto the roof from an overhanging branch to gain access to unoccupied attics. Once they get access into your household, they will contaminate the house with excrement and parasites. They will also gnaw through your electrical wires posing a potential fire hazard. They will also tear out your insulation looking for nesting material that will negatively affect the heating of your home. Squirrels living in trees are very difficult to get rid of for the average homeowner. However, residents can reduce the possibility of damages by placing squirrel baffles around trees that they would not want squirrels to inhibit. However, the only sure way you can completely get rid of squirrels for good is to call professionally trained personnel to remove the pest from your trees or attic. Expert squirrel removers have the capability of identifying entry points, sealing them off and also trapping pests. They will also implement measure to makes sure that once the squirrels are removed they do not return. Squirrels on trees near your home are not a threat. However, when they begin to pry into your household, it could be potentially harmful. Squirrels are a hazard to structures; they are known to punch multiple holes in buildings weakening their support beams. If this goes on for a long period, your house could collapse. One of the ways of identifying squirrels on your property besides actually seeing the nimble critters scurrying around is by looking out for squirrel nests. Squirrels build two types of nests, one called a drey which looks a lot like a birds nest and the other a den build into tree cavities and other hollow spaces. Squirrels typically build their dreys from leaves, twigs, moss and other natural debris. They begin with the base of the nest where the squirrels weave twigs together loosely. Next, come moss and damp leaves to strengthen the structure before weaving a sphere around the base to form the outer shell of the structure. Finally the squirrel’s stuff twigs, moss and leaves on the exterior of the structure and then line the interior with leaves, grass and bark. The drey can be up to 30 feet from the ground and is surprisingly sturdy. Squirrels choose a sturdy spot to build their drey such as where limbs branch off at the base of the trunk or between strong limbs. Squirrels seem to like maples, beeches, oaks and elm trees. These are made in tree cavities such as hollow tree trunks and previous woodpecker nests. The squirrel stuffs the den with moss, twigs and leaves to make it warm and comfortable. The animals prefer dens during winter since they offer more protection from the elements and predators. The squirrels will, however, make dreys in the absence of tree cavities to make dens. The winter dreys are significantly thicker and more insulated than during warmer months. Researchers have discovered that squirrel kittens born in dens have a significantly higher chance of surviving to adulthood than those born in dreys. Squirrels will take any opportunity to break into your home especially during the winter or breeding season. Squirrels prefer garages, attics, under sheds, inside walls, in the chimney and in crawl spaces. These locations offer optimal protection from the elements and from predators. Pay mind to the fact that squirrels break into the house to breed. Make sure that you have a good plan for the baby squirrels before evicting the mother otherwise the kittens will die of dehydration and starvation. Squirrels spend most of their active daytime hours foraging for food and often build auxiliary nests. These alternative dreys or dens are usually built haphazardly compared to the main ones but offer great protection if the squirrel needs to escape from predators quickly or if the weather turns suddenly. The squirrels may also store extra food in these alternative homes or use as pit stops to rest before going out to forage again. Squirrels can be found all over the world. This is natural considering the number of different species of squirrels available. Even though they all belong to the same genus Sciurus, their mating and gestation periods are often differing from one species to the next. The grey squirrel will normally have two breeding periods in a year, one will be in mid-summer, and the other will be in early spring. The young squirrels are normally born between March and April and the second litter will arrive between July and August. 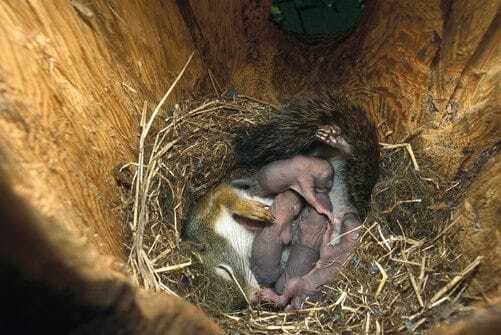 The female squirrels will give birth to up to nine babies at a time. However, it is more common to find three to five babies at a time. During this time, the mothers will seek protected safe areas where they can raise their babies. This is because trees often live their young ones vulnerable to predators. It is during this nesting period that squirrels will move closer to humans. They normally like making their nests in between walls, in attics chimneys and sheds. In case you bump into squirrel babies in your attic or wall, they have not been abandoned. The mother might have just stepped out to gather food for the babies. After some time, the babies will begin to venture out with their mother to seek more natural shelter. This is the best possible time to block re-entry into your walls, attic or chimney. In case you make a mistake of blocking the babies inside, the mother will take every necessary step to try and gain entry back, damaging your structures in the process. The young ones could also starve to death. Do squirrels nest in houses? Squirrels are known to enter our homes. They are agile rodents and will get in through the tiniest of holes. They do this by finding entry holes in already damaged areas of your home or construction gaps chewing their way in. 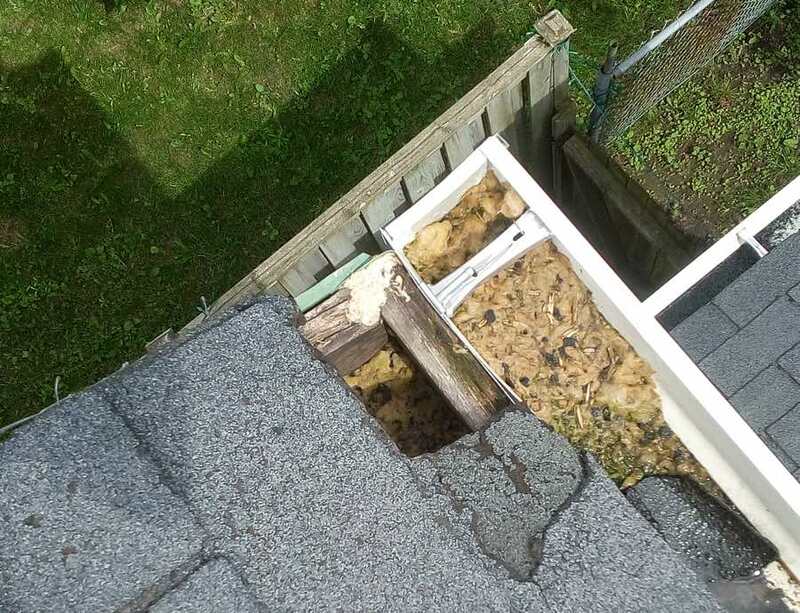 Sometimes, squirrels get stuck in attics, crawl spaces and in between walls, they will cause significant damage trying to get to their freedom. When squirrels get into your home, they will likely do this through the roof. They are normally looking for nesting shelter, and our attics offer the best spot. Squirrels seek out the attics since their young ones get vulnerable to predators when they nest in trees. When squirrels get into the eaves of your building, they will often cause damage by chewing through the holes. They are also known to chew through your attic insulation and electrical wires looking for nesting material. After some time, the baby squirrels will leave the nest to seek a more natural shelter. This is the perfect time to make repairs for the damages left behind. It is also the right time to seal off all entry points to ensure that the squirrels do not gain entry back into your attic. The best way to keep squirrels from nesting in soffits is by plugging the holes. Squirrels are known to chew holes in the soffits to make way into their nests. However, before you begin plugging the holes, it’s important to make sure that all the squirrels are out of the soffit. The best way to get the squirrel out of the soffit is to use a bait trap. A professional squirrel removal expert can be able to get rid of squirrels out of your soffits and keep them out for good. In case you notice squirrel activity in your home, you could have a nesting squirrel, at this point the nest line of action to take is to call a professional squirrel removal agent to help you get the squirrels out of your home. They will implement several methods of control to get the squirrels out. Do not light a fire to chase the squirrel out. You might roast the animals alive, especially baby squirrels that are unable to climb up the chimney and out of danger. A frightened squirrel may also try to escape down the chimney and into your house. Lighting a fire or using smoke is inhumane. Keep in mind that it is illegal to kill or harm wildlife in Tonto; squirrels are protected wildlife. A great alternative is to drop a heavy rope down the chimney to allow trapped squirrels to get out. The animals may want to get out in the first place but the surface is too slick to climb out. Inspect the chimney periodically and remove the rope once you are sure they have left. If you are sure that the squirrels are nesting in the chimney, bock all holes that they can use to get in and leave only the top of the flue open. Install a one-way door which will let the animals out but will block them from entering. Inspect your chimney with a flashlight to make sure there are no babies left inside. If there are, wear a thick glove and remove them by hand. Although removing squirrels from the chimney is not exactly difficult, baby squirrels are of particular concern. If you separate the mother from the babies, the latter will die from dehydration and starvation. The excluded mother will literally tear your roof apart if she realizes she cannot get back to her litter after a night of foraging. You also need to clean and disinfect the chimney and any other areas where the squirrels have been. Squirrel droppings and urine give off a pungent odour which soaks into your furniture, walls, upholstery and other places. There is also the risk of contracting airborne diseases present in the animal’s droppings and urine. Cleaning the inside of a chimney is not easy. 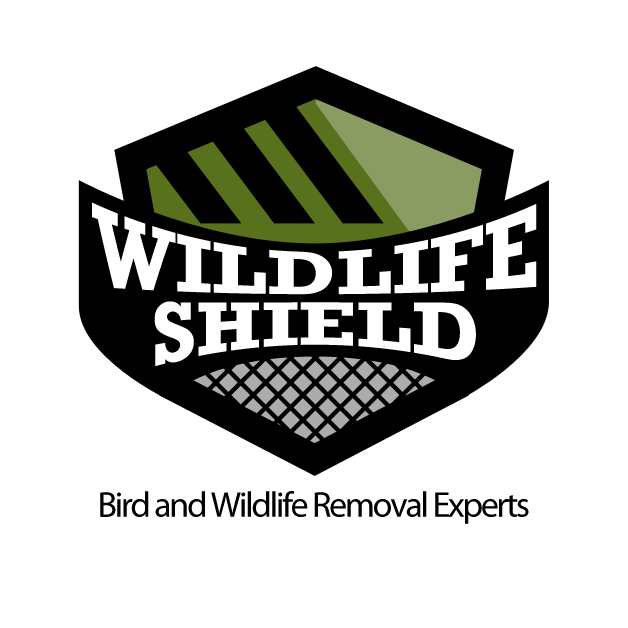 Hire a wildlife removal expert in Ontario to get rid of the squirrels and babies safely and humanely. The experts will also clean up the mess left behind and fix any damage the animals might have caused. They will also help to seal up your home so you don’t have to deal with this kind of problem again in the future. Ensure you get a warranty of at least two years for the removal service. If you hear that sound, the sound of animal feet above your head in the attic, or behind your walls, it is not a good sign. Squirrels are opportunistic creatures who often take up residence within your home. They find your home to be an appropriate shelter where they can build their nest, and even have their babies. Knowing how to remove a squirrel’s nest from your home is important so you can put a stop to the damages the critters can cause. There are many things wrong with DIY removal. In fact, this section will not emphasize how to remove squirrels yourself. Instead, it will explain why DIY removal is not in your best interest. For starters, you may come in contact with bacteria and infectious diseases carried by squirrels that can make you ill should you attempt to remove the nest yourself. What you can do, however, is call in a professional. A professional has the knowledge and gear needed to remove the nest without any risks. Further, the professional can ensure the removal of the next without harming the squirrel or any possible offspring. To begin with, a pro will don the proper gear to deal with the squirrel and nest removal. Gloves and even protective gear that covers exposed skin is common. If the professional knows the area is saturated in feces and urine, they may also wear an eye mask and a protective covering over the nose and mouth. A live trap is often used to capture the animal before removing the nest. Once the squirrel is captured, the professional will inspect the nest to see if there are any babies in there. If there are babies present, they will remain with their mother so they can be released into the wild together. Using gloves, the nest will be dismantled and removed. Afterward, the professional may clean the area using an antimicrobial fog to rid the area of any bacteria and infectious diseases. Allowing the professional to handle the nest removal and clean-up process is best because then you can rest easy knowing it is done the right way. If you suspect there are squirrels invading your home, contact a professional to assist you with squirrel nest removal. Even after the squirrels vacate, you will still need to remove the nest. Leaving any trace of the squirrel’s presence behind still puts you at risk for bacterial exposure and diseases.